Update April 2017: All charges against Alhaji Bello Damagum were dropped in 2009. A Nigerian newspaper owner has been charged with receiving funding from al-Qaeda to sponsor terror in Africa's most populous country. State prosecutors accused Alhaji Bello Damagum of allegedly taking $300,000 from a Sudanese branch to fund the operations of the "Nigerian Taleban". He also paid for Nigerians to go to terror camps in Mauritania, they added. 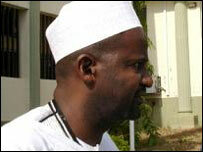 The director of the company which publishes the Daily Trust newspaper pleaded not guilty and was given bail. The Abuja High Court was told how Mr Damagun received money from al-Qaeda in Sudan in 2002 "to carry out acts of terrorism in the country". The prosecution also alleged that Mr Damagum had recently donated a minibus and public address system to help Islamists "spread extremism" in north-eastern Borno State. He was said to have deposited funds received from al-Qaeda in a UK bank. The court ordered the seizure of Mr Damagum's international travel documents to prevent him fleeing the country.